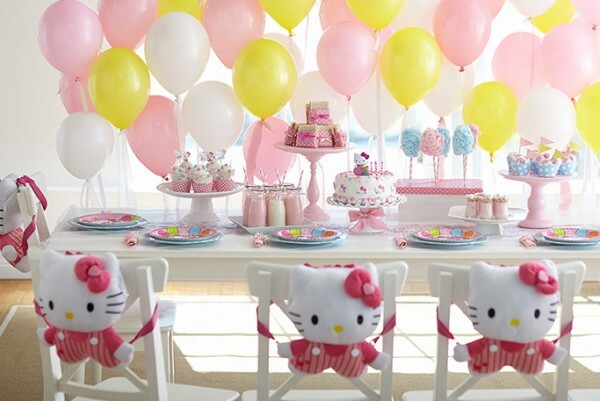 Girls of all ages are in love with Hello Kitty, so a birthday party featuring the beloved feline is guaranteed to delight. 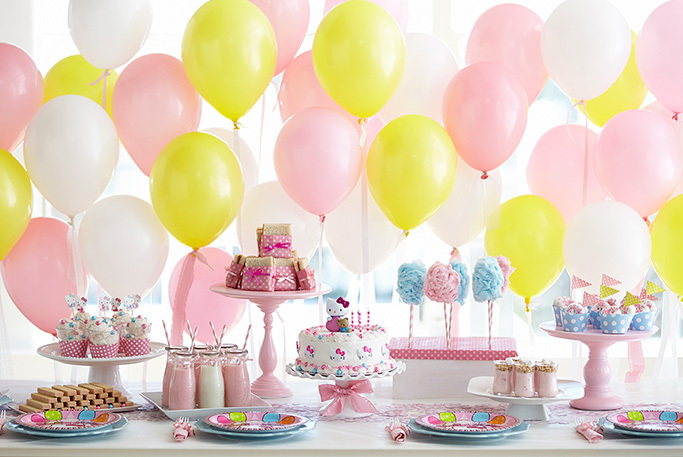 Our scheme draws inspiration from the Hello Kitty Balloon Dreams theme and integrates food as aspects of the decor—a simple way to make a bold statement! 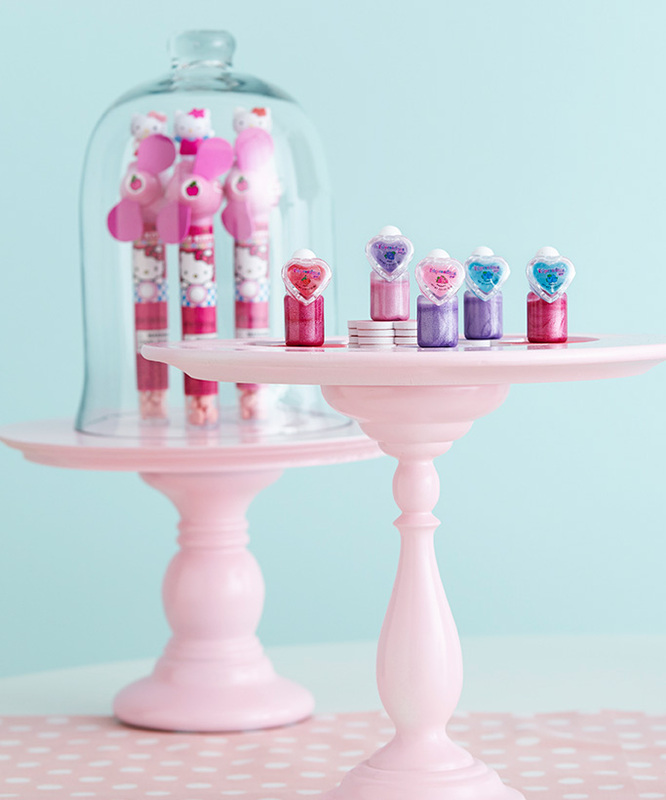 We softened the effect with cloudy white, but you can choose virtually any color to mix things up. The dining table doubles as a buffet with our photogenic, three-step party menu presented on pretty platters to add height and texture. 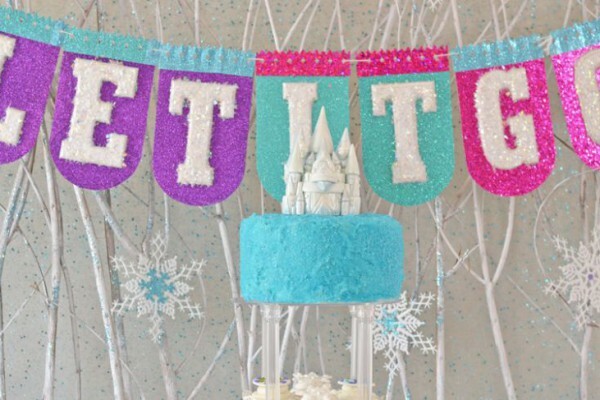 Colorful balloons filled with helium and trailing gauzy ribbon tied to balloon weights make a beautiful DIY backdrop. 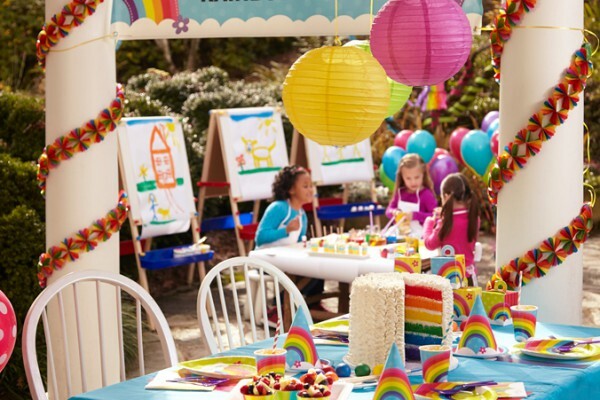 With so many Hello Kitty party supplies available, parents will delight at how easy this look is to pull together. For our place settings, we gathered white utensils in pink napkins, and then tied with matching ribbon. 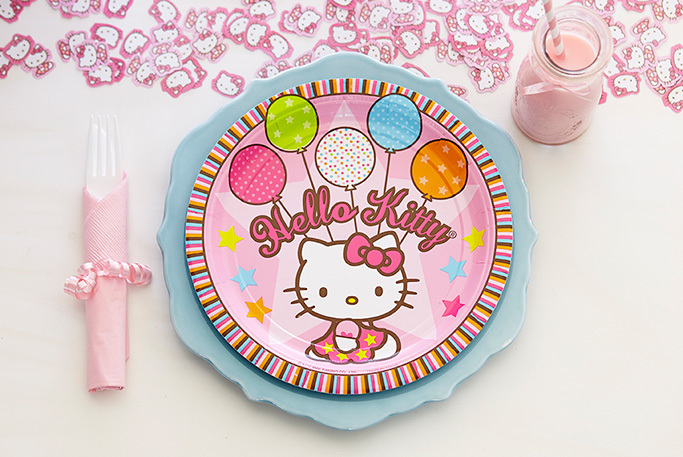 Hello Kitty Balloon Dreams plates were framed with “chargers” of pale blue china we already owned. Milk bottles were finished with pink ribbon and accented with striped straws. 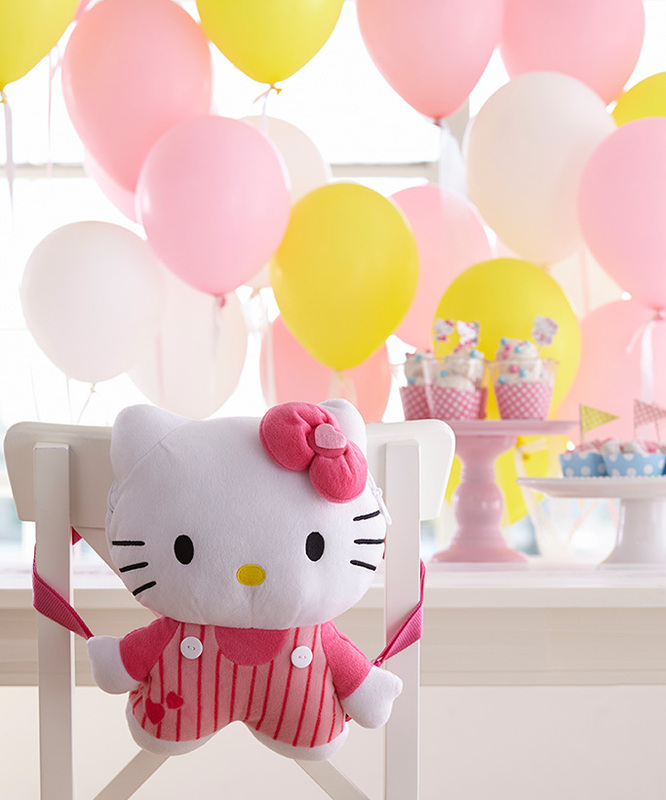 Guests will love taking home Hello Kitty backpacks as favors (which also add to the adorable decor). We sprinkled the dining table with Hello Kitty confetti before wrapping it all in a layer of airy white tulle to keep it from scattering and add to the ethereal ambiance of our decor scheme. 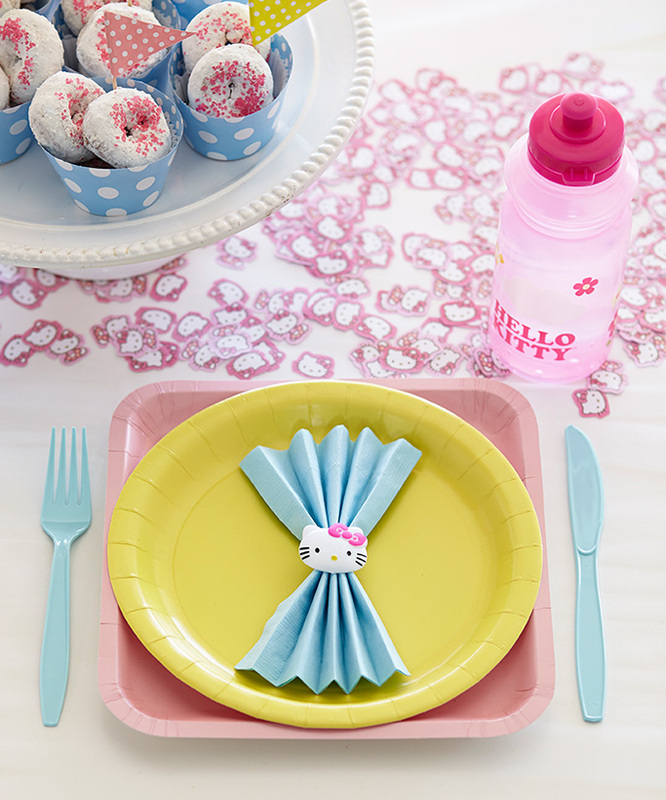 Our alternative place setting features a square-shaped pink dinner plate layered with a yellow dessert plate topped with a solid blue napkin bound with a Hello Kitty ring. Blue utensils tie the look together. 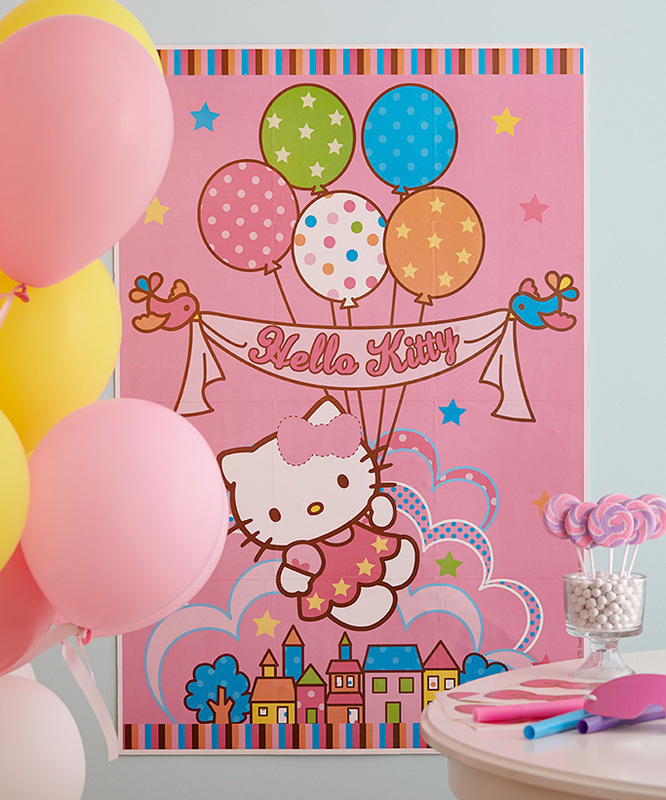 Customize your Hello Kitty party with our free matching printables! 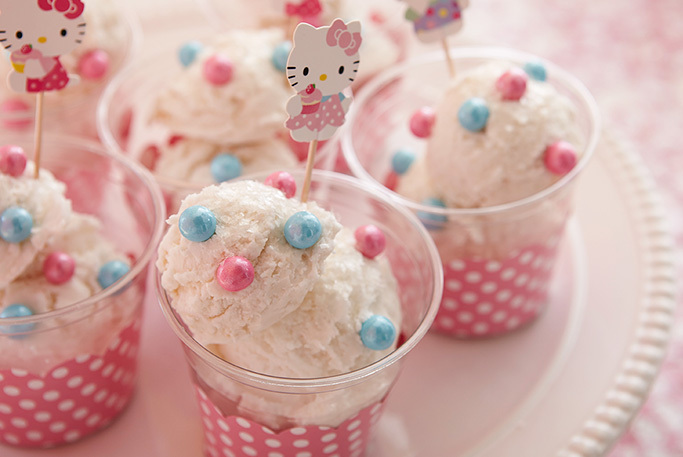 If your Hello Kitty party doesn’t fall during the lunch hour, a straightforward dessert-and-drink menu is all you need to serve. 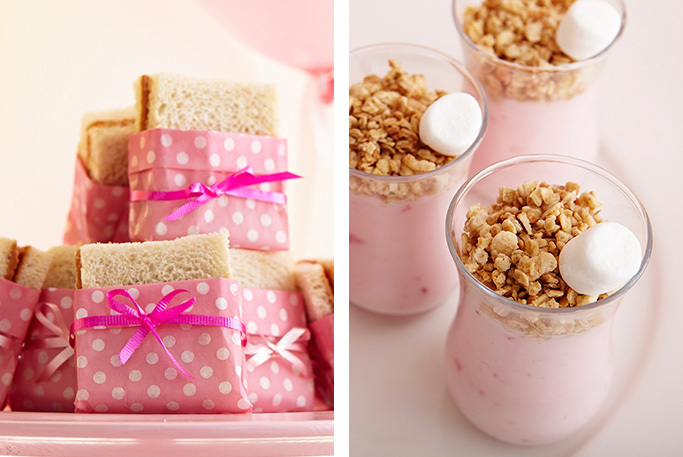 Update this simple option with a sweet presentation that’s pretty in pink. We took a plain white layer cake from the bakery and dressed it up in Hello Kitty style. Plain vanilla ice cream? Not at this party. 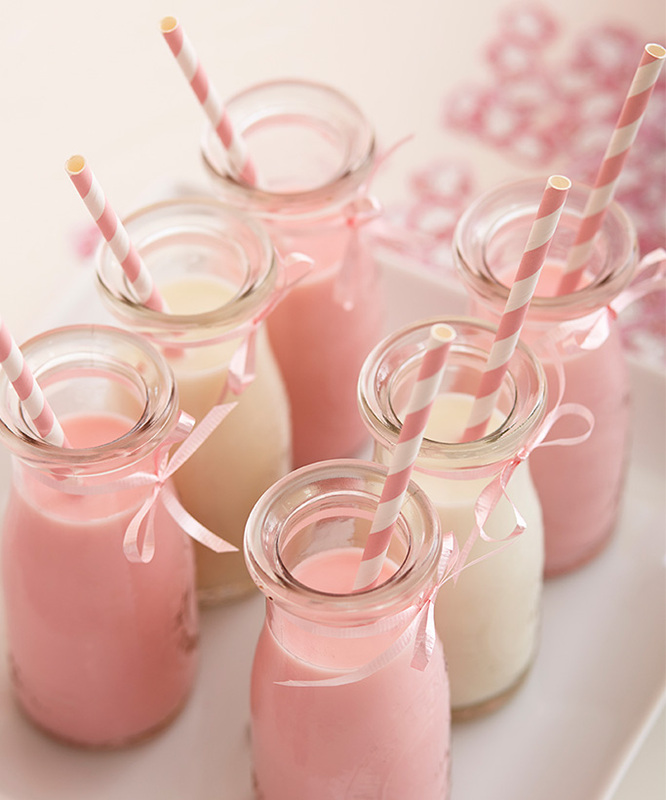 Alternating strawberry milk with plain adds color to mini milk bottles (and variety to the drink offerings). If the celebration falls during lunch – or you just feel like expanding the menu – a meal item and side is all you need to add. 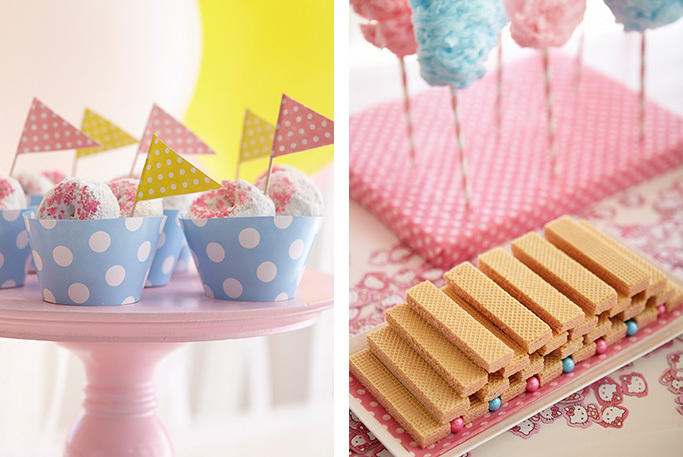 We wrapped crustless sandwiches with pink tissue paper and tied them with pink ribbon before arranging on a cake stand. Strawberry yogurt was spooned into clear cups before getting topped with granola and dotted with mini marshmallows. 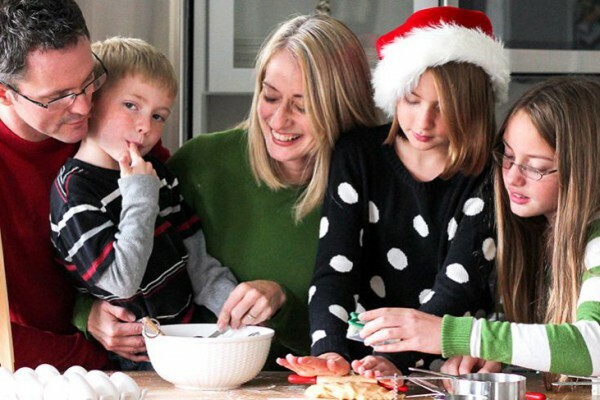 Guests will love “shopping” for their keepsakes at a favor buffet with boxes they personalized before the big spree. Create a crafting station by draping a decorative paper tablecloth over an available table and setting out art supplies in advance. 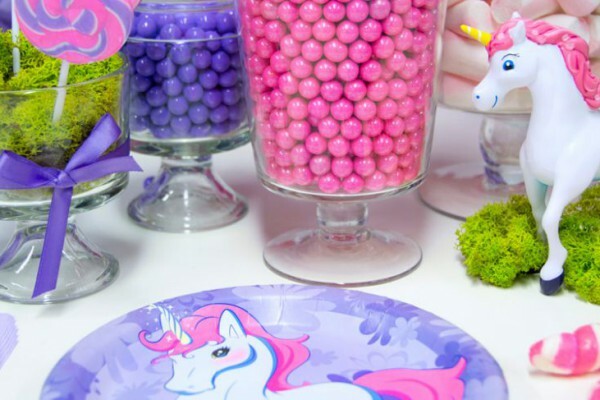 Have guests decorate some of the polka dots (one for every year of the birthday girl’s age) on their favor boxes by drawing patterns, adding Hello Kitty stickers, and/or sprinkling glitter over glue dots and tapping gently to remove the excess. Add a pretty blindfold fashioned from a scarf to this boxed-game activity for a personalized touch with minimum fuss. Guests take turns trying to attach Hello Kitty’s bow as close to the designated space as possible, and the person to come the closest wins! 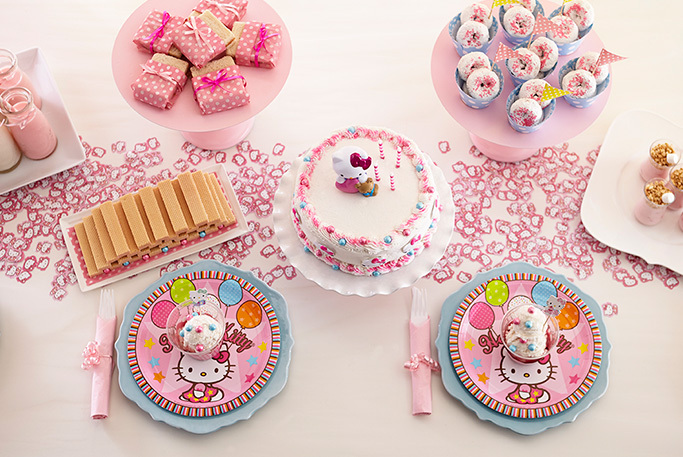 We created a pretty favor buffet by taking the contents of Hello Kitty Balloon Dreams favor boxes and arranging them by category on borrowed cake pedestals. 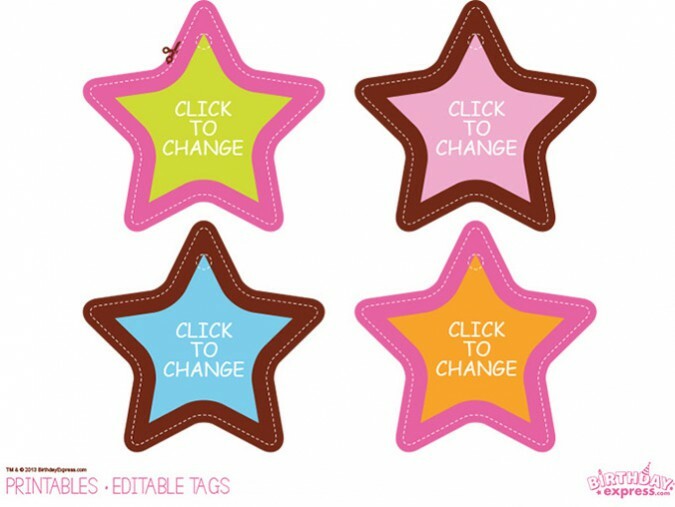 Simple signage you can print and personalize adds an elegant touch of direction, and the empty favor boxes guests decorated at the crafting station can be used as vessels. 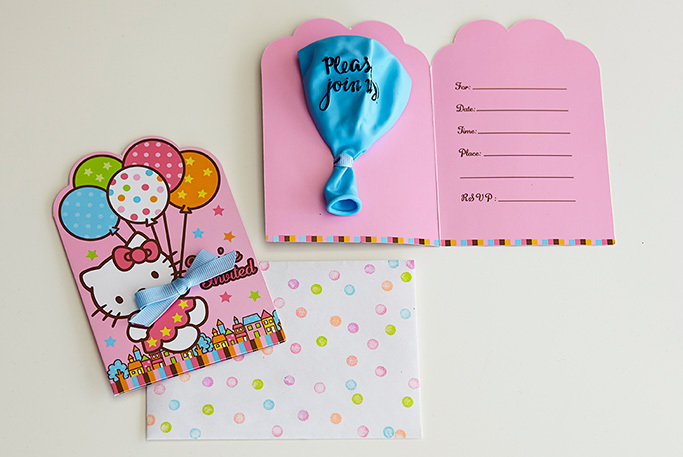 The standard Hello Kitty Balloon Dreams invitation – adorable on its own – gets an upgrade with some simple touches. 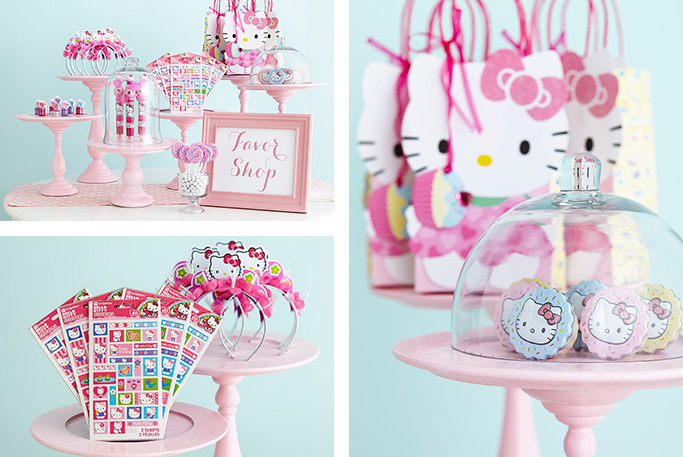 View the entire line of Hello Kitty products by clicking here.